Over the summer, I took a variety of interesting classes. The most interesting was a Computer Science course called Digital Storytelling. One week of assignments had to do with creating audio narratives. I expected these projects to be challenging, not only because I don’t think strongly in terms of sound, but also because I didn’t know of many sites on the web that offered sound bites freely available for use (see: Creative Commons). Thankfully, my professors had taken it upon themselves to solve this problem for us and compile a useful list of websites. If you’re not taking a music course or something like Digital Storytelling where the professor is directly asking you to for some kind of audio work, you might find that a bit of audio spruces up an otherwise visual-only presentation (think PowerPoint, or a video project). You might be surprised! Freesound.org — A site that aims to create a “huge collaborative database of audio snippets, samples, recordings, bleeps,” and is all available under the Creative Commons license. Free Music Archive — The FMA is directed by the WFMU, “the most renowned freeform radio station in America,” and was created out of the belief that the radio has always been a venue to offer free public access to new music and should continue to do so. However, this purpose is often undermined by licenses that were not made in (and could not predict) the digital era. Here at FMA, you will find great mp3s you can feel good about downloading. ccMixter — This is a self-described “community music remixing site featuring remixes and samples licensed under Creative Commons licenses.” Here you’ll find the opportunity to be endlessly creative and mingle with fellow music lovers. Internet Archive — The Internet Archive is a fascinating place that I have yet to really explore. The IA is attempting to create an Internet library in an age and space where sites and sounds are ephemeral. Content that appears on a site one day may be completely different the next. This is a great stop for more than just audio. The last time we discussed aviary, SfSS told you all about Aviary (http://aviary.com/home) and its ability to be your photo editor, for free. Well, while Aviary is still all about that, it has some new functions that you should know about. Let me introduce you to Myna, Aviary’s new free audio editor. Have you ever had a dream about being that awesome DJ, spinning incredible tracks with laser lights going off all around you? This could very well be your first step to realizing your ambitions, you go getter, you! It looks straightforward and comes with the same basic options that you would find on the older program Fruitloops, for those who have been in to making your own tracks for a while now. Although the snap shot only shows a few of the tracks it carries ten tracks that you can test. My favorite thing about this stuff is how absolutely painless it is for me to use. Everything can be simply snapped to the grid and edited within there. You have a whole host of options, creating fading in and out transitions, changing the gain, editing the clips, and more. The best way to get yourself acquainted to this fun tool is to just start playing with it, although there is a helpful quick screencast to get you started. Clips for this program come from three possible sources. 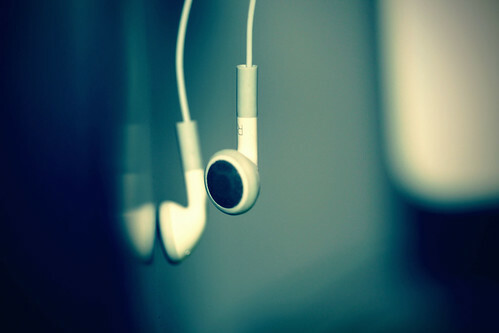 The library within Myna, which comes with a user’s agreement, boasts a wide range of clips from different cds, all of a techno genre or another. Next, your own media library can be used as a resource for clips. However, if you have say a part of a song that would fit so nicely into your mix, unless you have a clip prepared, it will generally pull the whole song, major buzz kill. Oh and that third source of clips? Well that is you, of course. You can record directly into Myna, instruments, your voice, a baby crying, whatever. Aviary as a whole is really awesome, especially with its support. I had some funky saving issues when I created my first song, but I dropped aviary a line, got a response in no time flat and straightened the issue out. So give it a whirl already! Ok, pay no attention to the cheesy and poorly written joke in the title of this post. This ‘Stuff’ post features one of my favorite open source software, Audacity, a free audio editor and recorder. 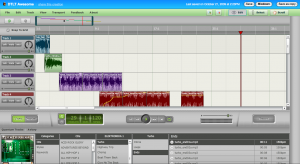 Audacity has many features including recording, import & export capabilities, editing and effects. For a free piece of software Audacity has a lot of power. I have used Audacity to record lectures during classes (very helpful if you learn best through auditory input), to create a quick recording of my friend’s jamming to a song on their guitars and to poorly mashup songs to create a whole new song. From basic recordings to advanced editing Audacity can handle it all. Even if you don’t need a piece of software like this all the time (I certainly don’t) it is a good program to have in your repoitore. Maybe you’ll even find reasons to use it more often once you start playing around with it. I will mention that in order to export from Audacity and encode your stuff you will need to download something extra but, Audacity will point you to where you need to go. So if you plan on exporting an mp3 from Audacity you’ll need to have the extra file.